The English Language Adobe Acrobat PDF owner guides for the Sony Alpha NEX-5 are now available for download at Sony.com. There are two versions of the NEX Series user manual available. The first is titled “Sony Interchangeable Lens Digital Camera Instruction Manual”, has 82 pages and weighs in at 6.7 MB (Megabytes). Right-click this download link and save the user guide to your hard drive. 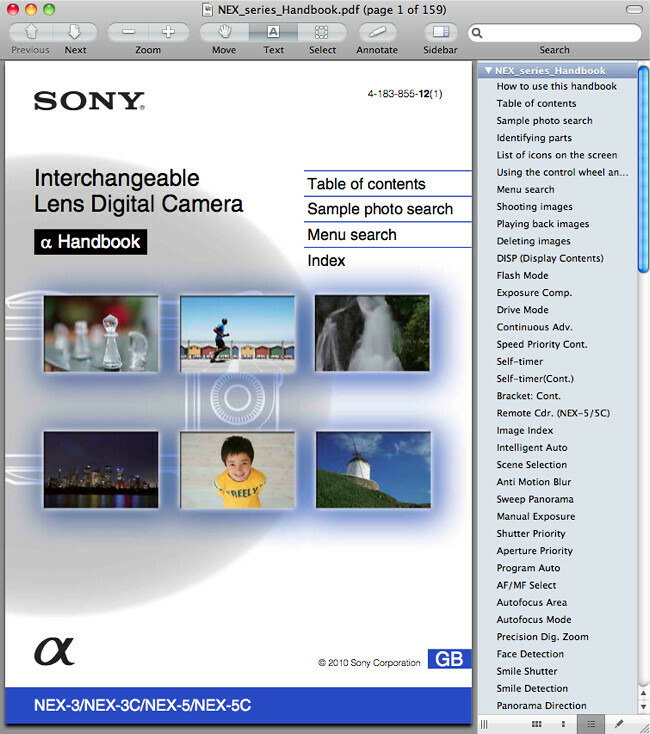 The second is titled “Sony Interchangeable Lens Digital Camera α Handbook”, has 159 pages and weighs in at 3.4 MB. Right-click this download link and save the user guide to your hard drive. If the download links didn’t work for you, visit the eSupport page for the NEX-5, and manually locate the download links titled “α Handbook” and “Instruction Manual”. 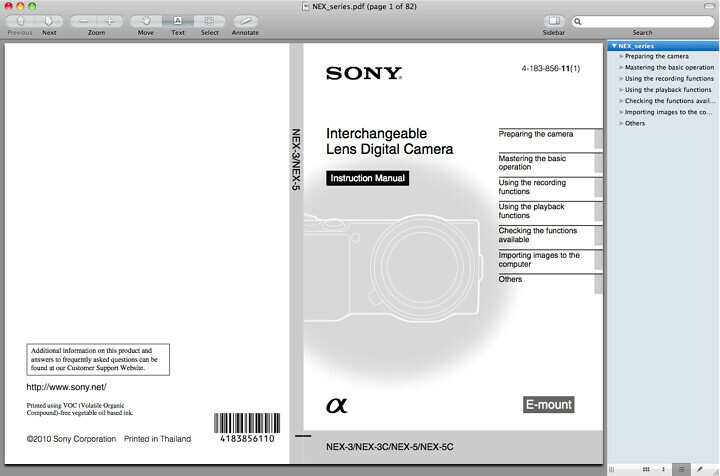 Unlike with Nikon, Sony allows you to freely print the NEX-5 owner’s handbooks without building in any password protection into the PDF. You’re also free to copy portions of text from the PDFs. Both manuals discuss the features of the NEX-5 and how to use the camera. The Handbook is geared towards understanding the recommended camera settings for a variety of photographic situations and circumstances (using the clickable “Sample photo search” tab), and is printed in color to facilitate this approach. 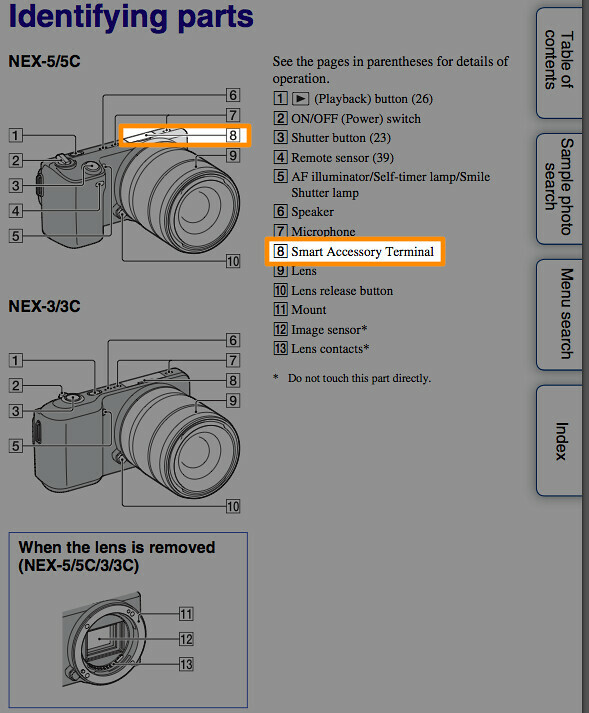 The location of the smart accessory terminal is illustrated on Page 11 of the Sony NEX-5 Handbook. Sony makes the ECM-SST1 compact stereo microphone specifically to connect to the Smart Accessory Terminal on your NEX-5. 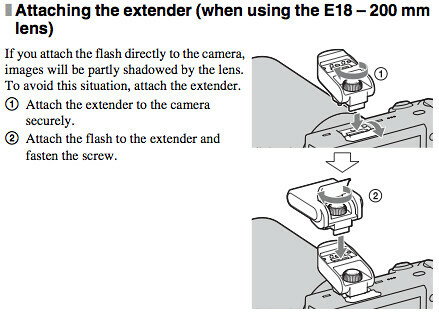 Attaching the extender when using the Sony SEL18200 E-Mount 18-200mm lens, as documented on page 24 of the Sony NEX-5 Instruction Manual. Using the Remote Cdr. 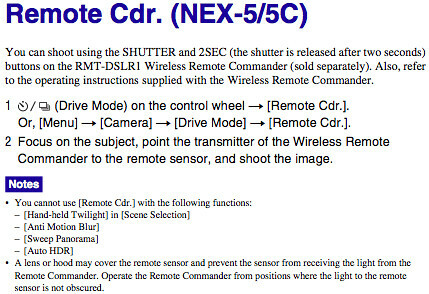 setting with the Sony RMT-DSLR1 Wireless Infrared / IR Remote Commander (a variety of compatible, third-party alternatives exist), as documented on page 39 of the Sony NEX-5 Handbook. 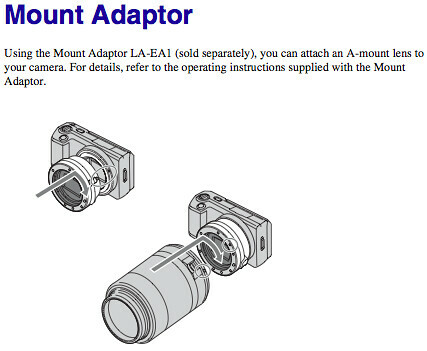 Using the Mount Adaptor LA-EA1 to attach Sony A-mount lenses, as documented on page 152 of the Sony NEX-5 Handbook. Popular Sony NEX-5 books and other printed literature and reading material in the Arts & Photography and Books section on Amazon.com.